Picture this scenario: Your boss walks up to you one morning and tells you to research e-learning authoring software so your department can purchase a tool to develop e-learning. You hardly know anything about e-learning in general, never mind e-learning authoring software. You do an online search but quickly become lost in the sea of information, opinions, and product specifications. All you want is some general information about what e-learning authoring software is all about, but you can’t seem to find it! If this scenario sounds familiar and you’re looking for some general information about what e-learning authoring software does, who uses it, and what you should consider when looking to purchase it, you’ve come to the right place. Read on to find out the main things you need to know about e-learning authoring software. E-learning authoring software allows you to develop e-learning courses (also known as computer-based training, online training, online courses, and distance learning). There are a variety of e-learning authoring apps on the market, but they all have one thing in common: they let you create a “learning experience” that’s viewed on a computer and/or mobile device. Since this type of e-learning authoring software application is hosted on a server and accessed through the web, there’s no need to install anything on your computer. One major advantage of using a web app to develop your content is that you can develop it anywhere, anytime. All you need is a web browser. Web applications often have streamlined user interfaces, making them easier to use than their desktop counterparts. If you’re new to e-learning and feeling a little intimidated by all the complex apps out there, web apps are the perfect place to start! Some web apps, like Rise, allow you to create fully responsive e-learning (courses where the content automatically reflows depending on the screen size) without any extra effort. In today’s mobile world, not having to worry about how your courses will look across devices will make your life a lot easier. Desktop applications are e-learning authoring apps that you install on your computer. Desktop apps, like Articulate Storyline, are typically more robust than web apps or PowerPoint plug-ins and offer a range of features that are not available in more basic apps. This type of software is ideal for building more custom e-learning courses and projects with nonlinear (branched) navigation. Desktop e-learning applications can also offer advanced interactions, additional customization options, and powerful screen recording capabilities. These e-learning authoring applications are add-ons to Microsoft PowerPoint that allow you to add functionality, such as narration and quizzes, to your presentations. PowerPoint Plug-ins, like Articulate Studio, are perfect for when you have existing PowerPoint–based training materials, such as presentations created by subject matter experts, that you want to make into a course. No need to copy and paste your content into another tool—you can start adding interactivity immediately! No matter what type of authoring software you use, you’ll have to publish your course when you’re finished so your learners can view it. And with many learners using phones and tablets to access e-learning, you’ll probably want to make sure your course works on mobile devices. Most modern authoring apps allow you to publish to two common file types: HTML5 and Flash. In today’s mobile world, you’ll definitely want to be able to publish to HTML5, as most mobile devices aren’t Flash compatible. But even if you don’t plan on creating mobile courses in the immediate future, you don’t want to limit yourself to Flash-only output, as some browsers—even on desktop computers—are doing away with it for security reasons. In short, make sure the authoring tool you choose will allow you to publish your course in HTML5 format. For more info about creating mobile-friendly e-learning, check out this article. A wide variety of people use e-learning authoring software. Some applications require no (or minimal) coding or programming knowledge by users. This means if you have average computer skills, you can use e-learning authoring software to develop online training. Common users of e-learning authoring software include people who work in training departments, instructional designers, and course developers. The main thing you’ll do with e-learning authoring software is develop training that’s available on computers and/or mobile devices. There are two general types of training courses you can develop using e-learning authoring software: linear courses and nonlinear (or branched) courses. Linear courses are the most basic type of e-learning built with e-learning authoring software. The word linear means “arranged in a straight line.” The navigation for a linear course is fixed and flows in one direction. Learners click “Next” or “Continue” to advance sequentially from one slide to the next. 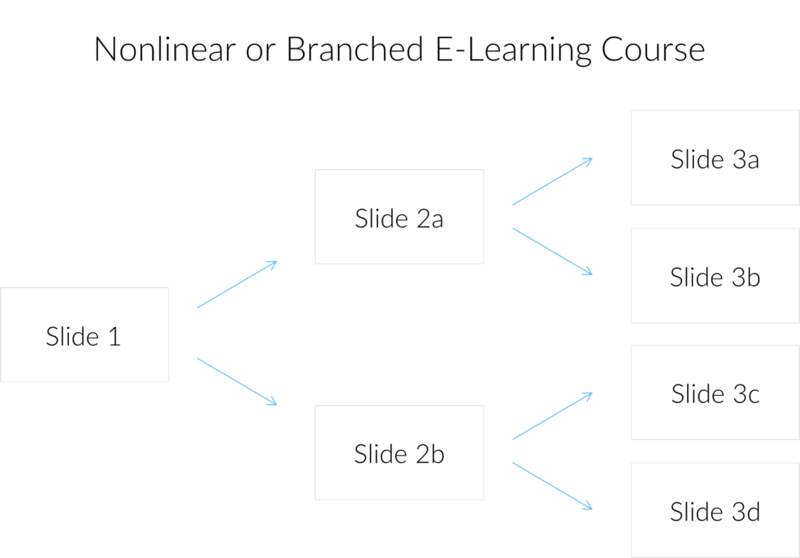 If you need to build a course that demonstrates a step-by-step process, for example, a linear e-learning course structure might work well. This type of e-learning course can be easily designed using a web app or PowerPoint plug-in. 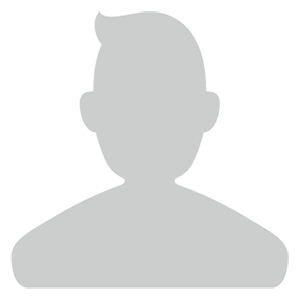 Nonlinear courses include branched navigation, often with interactive scenarios where you present learners with multiple choices or options. Instead of learners clicking “Next” to move forward in a linear path, they’re branched to different paths based on their choices or actions. 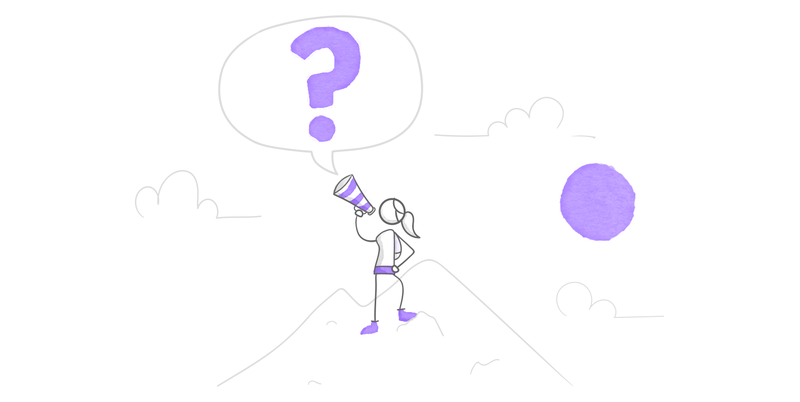 For example, if you’re developing a customer service or sales-based e-learning course, you can show different customer reactions based on the specific choices the learner makes. For a situation like this, using a nonlinear e-learning format might work best. Desktop e-learning authoring apps like Articulate Storyline are made to help you design this type of e-learning. Are you looking to create linear or nonlinear courses? Do you need to create software simulations? Does the app publish to HTML5 (for mobile compatibility)? Does the app have responsive features? Every project is different and has its own set of requirements. To choose the right e-learning software for your project, start by documenting what you would like the course to do and how it will be accessed by learners. Then you can compare your list of requirements to the list of the software’s features. Here’s another helpful article to help you think through your decision: Top 9 Considerations for Choosing the Right E-Learning Authoring Tool. Now that you’re armed with general information about e-learning authoring software, hopefully you’ll feel more confident as you consider your options. If you have any questions, we encourage you to reach out to others in the community by posting a question in the forums. This is a very helpful series - and, for me, definitely an e-learning experience. Do we underestimate the "click and scroll" methodology? Lots of considerations that don't make this list. Desktop tools are notoriously bad for collaboration with other authors or contributors, and they are also weak in enabling reviewers to add commentary (Storyline is no exception). There's a lot more to authoring than whether or not you can import PPT. For example, can you define objectives and link them to activities? Can your objectives define the design? Can you enable an immersive experience for your learners? Are the bullet points under "Here are some resources to help guide you" meant to be links? If so, the links aren't working currently. Good article. Subject Title does not match the text though. For the text presented the Title should read 'Some Key Requirements for any E-Leaning Software' The present title is incorrect since not all probable requirements are mentioned (see others comments for examples) and the text only mentions requirements without mentioning how to match them up with any or some or all of the e-leaning authoring software out there (other than to tell the reader to match with the 'Features" listed by the software vendor). Since all vendors do not "sell" or "explain" their software using the same terminology as used in the text (some don't even use the word or provide a list of "features") this article does not give the reader sufficient description of elearning software itself. This is like a wish list of what the author thinks E-LA software SHOULD do but relates no information of what available software WILL do: hence cannot be considered as an 'Overview of of E-learning Authoring Software". Your problem you identify is quite correct though - picking the correct software to use/buy is a big problem. A clear and nearly-correct "Needs List" is the first step (your article). However the effort to do this will be to no avail if the second and equally time consuming and important step is not done - matching the means provided by the software to the needs list including an means to hve vendors customise their software to get a one to one match. In my experience most software vendors in this arena do a poor job of explaining the methods/means imbedded in their software (what they programmed the program to do. Most just default to presenting their tool as the swiss army knife (i.e. - meeting all needs common for the arena). If you argue for a specific need (feature) they just say that your need was not common therefore not included in 'their' offering - yea who does get to decide "common" anyway? Most vendors do not adhere to the belief that "the customer is always right". They belive that the way to Perhaps an article from you on "How to match Your needs list to Vendors offerings" should be your next article after you retitle this one. From reading your other articles you seem to have a great knowledge of the subject arena and I for one would be interested in your ideas and perspective on picking the correct software BEFORE doing the time consuming trial and error thing that the vendors favor.